Dark matter could sling lethal meteors at Earth, potentially causing mass extinctions like the cataclysm that ended the Age of Dinosaurs, Harvard scientists say. Physicists think the mysterious, invisible substance called dark matter makes up five-sixths of all matter in the universe. It was first detected by the strength of its gravitational pull, which apparently helps keep the Milky Way and other galaxies from spinning apart, given the speeds at which they whirl. Scientists have recently suggested that a thin, dense disk of dark matter about 35 light-years thick lies along the central plane of the Milky Way, cutting through the galaxy's disk of stars. The sun travels in an up-and-down, wavy motion through this plane while orbiting the center of the galaxy. Researchers suggest this disk of clouds and clumps made of dark matter might disturb the orbits of comets in the outer solar system, hurling them inward. This could lead to catastrophic asteroid impacts on Earth, of the kind that likely ended the Age of Dinosaurs, said theoretical physicists Lisa Randall and Matthew Reece at Harvard University. 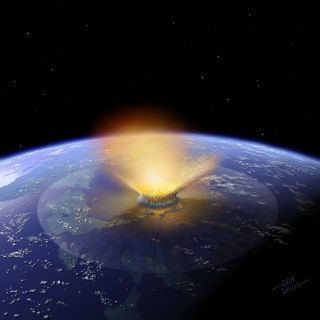 Past research has suggested meteor bombardment of Earth rises and falls in a cycle about 35 million years long. In the past, scientists have proposed a cosmic trigger for this cycle, such as a potential companion star for the sun with the dramatic name "Nemesis." Instead of blaming a "death star" for these catastrophes, Randall and Reese point out that this cycle of doom closely matches the rate at which the sun passes through the central plane of the Milky Way. This hints that the galaxy's "dark disk" may be the actual culprit. These illustrations, taken from computer simulations, show a swarm of dark matter clumps around our Milky Way galaxy. Image released July 10, 2012. The researchers analyzed craters more than 12 miles (20 kilometers) wide created in the past 250 million years, and compared their pattern against the 35-million-year cycle. They found that it was three times more likely that the craters matched the dark matter cycle than that they occurred randomly. This cycle might have killed off dinosaurs about 67 million years ago. "The cycle is slightly off for that mass extinction, but we have an incomplete data set regarding impact craters, so maybe with more information the cycle might fit what we know better," Randall told Space.com. Although a three-to-one chance sounds impressive, the researchers cautioned that this statistical evidence is not overwhelming. The scientists note that the European Space Agency's Gaia mission could reveal the existence or nonexistence of a dark matter disk. Launched in 2013, this mission will create a precise 3D map of stars throughout the Milky Way, potentially confirming or denying the existence of a dark disk that gravitationally influences stellar motions. "Even if it's a remote possibility that dark matter can affect the local environment in ways that have noticeable consequences over long periods of time, it's still incredibly interesting," Randall said. The scientists detailed their findings online April 20 in the journal Physical Review Letters.